I have 2 favorite kitchens, actually. They each belong to my grandmas. They are spacious, clean, and colorful. The appliances are simple, a tiny stove and a very small fridge but oh my gosh are they decorated. 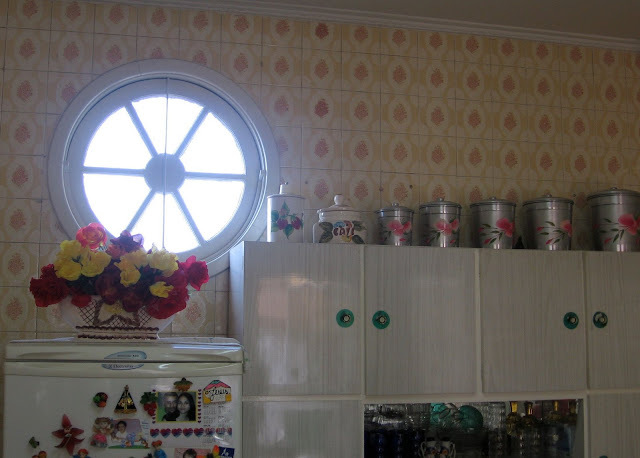 This is my Grandma Maria's kitchen which is full of bright plastic flowers and bowls and cans decorated with flowers. Heck, she is even decked out in flowers when she cooks. On one wall she has a huge painting of The Last Supper right above her trusty radio. She says that when she eats she likes to sit down look up at Jesus breaking the bread and listen to socialist talk shows. You gotta love the woman. When you come to Brazil with me I promise to take you there because her food is just as fabulous as she is. But before that happens I am curious to know where your favorite Kitchen is. Oh my... I have so many. My grandma has an absolutly beautiful new kitchen. Like the ones you'd see in a magazine with a country twist. I love it because of the big counters. I never seem to have enough counter space. and the red and yellow all over are my fave. But I also love small kitchens. As small as mine is I really like it and its very homy. I just like lots of color and practical appliances. and pictures of food and a whole shelf of cook books! I love that stove. Waaaaah. I miss my gas stove. I love this post! This is my favorite post in the history of the internet. You are brilliant. Your Grandma is adorable and she has amazing taste. 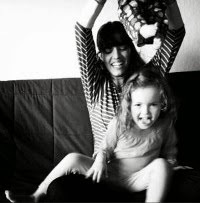 Love her and love you!